William Suhanek was born on February 26, 1966, in Skokie, Illinois to Lewis and Madaline (nee Foderaro) Suhanek. He died Friday, October 19, 2018. Bill was a Transportation Broker with CEI Transportation from 2001-2017. He was a hockey goalie starting at age 5, as a Mite, and played up to college level, making the Varsity team as an incoming Freshman at Miami of Ohio University. 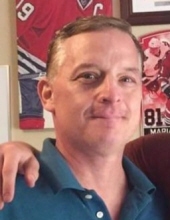 Bill was the Senior Goalie Coach with Midwest Goaltending School in the Northwest Suburbs of Chicago for 9 years where he mentored many young goalie students. Three of Bill's students went on to play in the NHL as goalies, one still plays for the Ottawa Senators. Bill was loved for his sense of humor and always having a way to help others feel loved. Bill will be missed dearly. William is survived by his son, Ryan Suhanek; his father Lewis (Pat); and his beloved partner, Kimberly M. Long-Suhanek. He is preceded in death by his mother, Madaline. Visitation from 10:30 am until time of Prayer Service at 3:00 pm, Saturday, October 27, 2018, at Glueckert Funeral Home Ltd., 1520 North Arlington Heights Road, Arlington Heights, Illinois. Interment private. In lieu of flowers, memorials may be given to Rosecrance Foundation, 1021 North Mulford Road, Rockford, IL 61107, www.rosecrance.org/give. "Email Address" would like to share the life celebration of William Joseph Suhanek. Click on the "link" to go to share a favorite memory or leave a condolence message for the family.